In the aftermath of separation from London Transport, LCBS was free to pursue its own vehicle policy. At the same time as taking delivery of the last AEC Swift vehicles, alternatives were being specified for evaluation. Stevenage was the location for a bold experiment in running high-frequency, flat-fare services over the short urban routes. 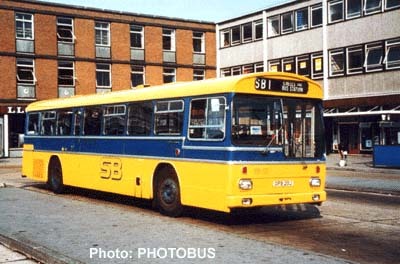 A batch of Swifts were allocated to the 'SuperBus' routes, but the suprise was the purchase of a batch of four Metro-Scania single-deckers split over 1970/71. These were very advanced machines, with fully-automatic transmission and full air-suspension. They were also foreign, noisy, thirsty and not very reliable. On the other hand, when they went they went like a rocket, and only the rather squishy, wallowing suspension spoiled the effect. In fairness, they must have been reasonably successful, for three more were obtained from Hants and Dorset (ex King Alfred) in exchange for Leyland Nationals which were starting to join the fleet in droves. This variety of vehicles made Stevenage Bus Station a very exciting place. They did not stay in the pristine condition displayed by MS2 above for very long. Published photos of these and their fellows after a short period in service show distinctly a distictly unkempt appearance, with dirty, dented and flapping body panels. To my knowledge, they never strayed from Stevenage, apart from use as an engineer's spare when attending to boiled or bust Leyland Nationals. They were the only examples to serve the National Bus Company. The last time I saw any of these was at Friars Wash near Dunstable, parked up at a dealer's yard in about 1978. They are about the least popular and least documented of any vehicles that have served in the London fleet, but I promise to dig further. 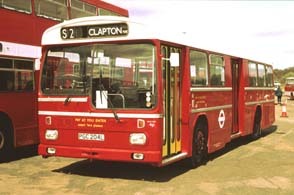 London Transport also tried out half a dozen of these vehicles, alongside Leyland Nationals. One of those vehicles (now preserved) became notorious for following its destination blind to the ultimate extent by immersing itself in Clapton Pond. The picture was taken at Cobham Open Day 1999. The paper under the nearside windscreen wiper was a 'For Sale' notice, if you fancy it!